Preheat oven to 350 degrees F. Spray 9x13 inch pan with cooking spray. 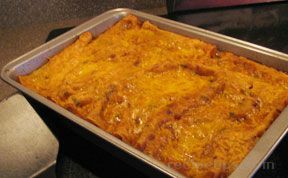 Mix enchilada sauce and tomato sauce together; set aside. 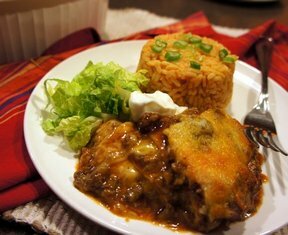 Mix beef, refried beans and 4 tablespoons enchilada sauce mixture. Spoon beef mixture into tortilla along with onions and cheddar cheese. Roll tortilla up and place seam side down in prepared pan. Repeat with all tortillas. Pour remaining enchilada sauce on top of rolled tortilla shells. Sprinkle with remaining Cheddar Cheese. Bake for 20-30 minutes. 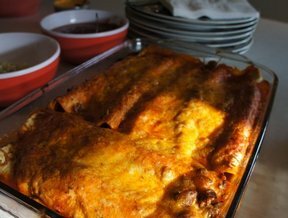 "I haven't had refried beans in my enchiladas before. I loved it. 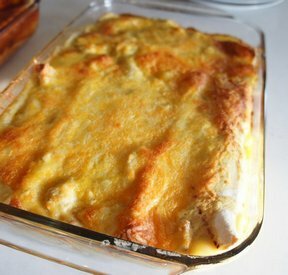 It thickened the filling up."